The College will be offering Irish-medium professional development for teachers and classroom assistants who work in the Irish-medium sector. A new M-level specialist option has been designed in Irish-medium Education. Bursaries for the following courses have been provided by the Department of Education through the Council for Irish-medium Education. 26 February, 5 March and 12 March, 2019 - 3 full days. An applications form for the course is available on-line. An important development in Irish-medium provision at St Mary’s is the Irish Language Course for Classroom Assistants and Ancillary Staff. We are very pleased to be able to contribute to the professional development of staff who are working in an Irish medium environment. This course has been designed for Classroom Assistants and ancillary staff working in other areas, e.g. administration and catering. The funded course will be offered at three levels of competence in Irish – beginner, intermediate and advanced. 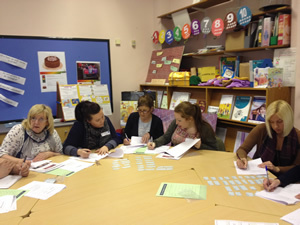 The course is funded by the Department of Education and supported by Comhairle na Gaelscolaíochta. Application forms for the course may be requested from Academic Registry. Forms can also be downloaded for return by post/ fax or an electronic form may be completed and returned by email. Beidh an cúrsa seo dírithe ar riachtanais na gCúntóirí Ranga agus na mball den fhoireann choimhdeach sa scoil. Tá muid thar a bheith sásta go dtig linn riar ar na riachtanais forbartha gairmiúla atá ag baill foirne i dtimpeallacht lán-Ghaeilge. Dearadh an cúrsa seo do Chúntóirí Ranga agus do bhaill foirne atá ag obair i réimsí eile – m.sh. riarachán, lónadóireacht. Déanfar freastal, taobh istigh den chúrsa, ar 3 leibhéal cumais sa Ghaeilge – tosaitheoirí, idirmheánach agus ardleibhéal. Beidh an cúrsa á mhaoiniú ag an Roinn Oideachais agus tugtar aitheantas do thacaíocht ó Chomhairle na Gaelscolaíochta. Féadfar iarratais a fhoirmiú don chúrsa a íoslódáil nó a iarraidh ón Oifig Iontrála. Module details can be located in the M Level prospectus from page 23 onwards. Bursaries may be available for this course, subject to funding by the Department of Education. Applications forms for the course will be available from the Academic Registry.